St. Louis Activist Hub: Twitter Fight! Foreshadowing The St. Louis Mayoral Election? Twitter Fight! Foreshadowing The St. Louis Mayoral Election? Sure seems like there's going to be a pretty interesting Mayoral election. Hope there is a change next year. Kennedy's comments in that video reflect hurt pride over discussion of the issues. They have a point, though. In an ideal situation, all stakeholders working together for consensus creates change with buy-in and momentum. But, this isn't a social club. It's STL politics, and too many people from all sides are saying "what's in it for me?" or "why wasn't I consulted?" then flexing political power in retaliation. 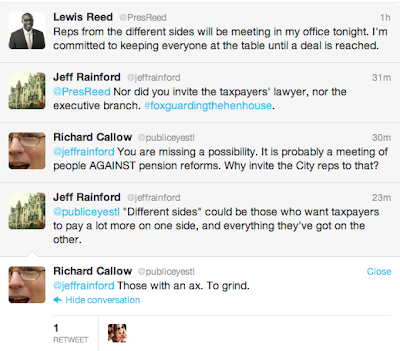 That's polarization out of spite, and it is just as bad as the exclusion tactics for the city. How about on the count of three, we all check our egos? Ready? 1... 2... 3!